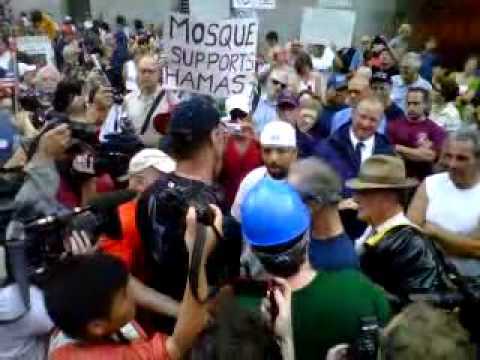 The demonstration held on Sunday against the Park 51 Muslim community center in lower Manhattan was an attempt by the right wing to strike at first amendment freedoms, but at the same time, it was simply a revival of urban policies of discrimination that were routine in the last century. That the demonstration had racist overtones is clear from this video of the event at YouTube, which caught the crowd’s harassment of and near attack on an African-American carpenter the rightwingers perceived as a Park 51 supporter. He is caught on audio pointing out that the mob actually did not have the slightest idea what he thought about anything. The opposition to the Muslim center contravenes the ideals of the US constitution, which says that “Congress shall make no law respecting an establishment of religion, or prohibiting the free exercise thereof.” The 18th century English can throw us now, or seem obscure. Under British colonialism, the Established Church in, e.g. Virginia, was Anglicanism, the branch of Protestant Christianity of which King George III was the head. The Anglican Church received state funding (Virginians who did not like it were taxed to pay the salaries of corrupt clergymen sent out from London anyway). It was also arrogant and oppressive. Its officials had Quakers who declined to be baptized tossed in prison. That was what an Establishment of a religion was, which the Constitution seeks to prevent in the new Republic. It was an imposition by the Government of an official religion, supported monetarily by the state, and the punishment of those groups that offended the Established one. We could translate the Clause: “The US Congress is forbidden from trying to make one religion more special than another, and from stopping people from worshiping as they please.” Originally, this principle applied mainly to the Federal government, but over time the states gradually adopted it into their constitutions, as well. The rightwingers in Manhattan yesterday were attempting to assert that the site of the destroyed World Trade Center is Christian or perhaps ‘Judeo-Christian,’ and that those traditions have a special prerogative in that area. In contrast, they identify Islam with the attackers (even though Usama Bin Laden openly said of the hijackers that ‘those young men had no fiqh [Islamic law]’– i.e. they were lawless secret operatives rather than proper Muslims.) Al-Qaeda is a vicious cult, as little connected to mainstream Islam as Timothy McVeigh was to Christianity. The demonstrators want to get around the Constitution by creating a sacred geography of sentiment that is outside ordinary legal reality. It consists of a space of white American Judeo-Christian victimhood and of another realm, of a brown, foreign, hostile Islam that must be excluded from lower Manhattan (never mind that these characterizations of American Muslims are pure falsehood). It is an attempt to create a space within which one religious tradition is favored over another, and an attempt to deny members of a religion the opportunity to practice it wherever they like. They grant the technical ‘right’ to the Muslims to worship there, but then seek to withdraw that right on the ground of hurt feelings or inappropriate geography. We saw this sort of thinking in the Jim Crow era, when African Americans, though full American citizens, were prevented from living, shopping, working, and inevitably from worshiping, in certain geographical areas, on the grounds that their doing so would offend and hurt the feelings of the White majority. Of course, the abstract ideal of the Establishment and Practice Clauses of the Constitution has not suddenly been achieved in American history with no struggle. The early understanding of the Establishment Clause was less expansive than our current approach. But on the way to our current understanding of the First Amendment, urban America made a very big and unfortunate detour. The controversy of the siting of the Muslim community center in lower Manhattan is nothing new in American history. Although we now forget previous decades of residential and religious discrimination, telling people where they can live and worship within a city was common in the first half of the twentieth century. “Protective Associations” agitated to keep Buddhist temples or even Japanese churches from being built. In Los Angeles, African-Americans and Japanese were only allowed to live in certain neighborhoods. Synagogues were also carefully policed. Limitations on where places of worship could be built were central to this effort to create and and preserve privileges for people who thought of themselves as white Christians. Some historians assume that residential segregation was economic, that minorities could not afford to live in the white areas. But as historians have gotten into the municipal archives, they have found that city councils made rules about where people could live and worship, and that urban young people formed race-based gangs to harass minority members who tried to move out of the areas formally designated for them. Where those rules were struck down by the courts, people turned to private ‘covenants,’ written into real estate sale deeds, which performed the same function. While the Supreme Court found the latter unconstitutional in 1949, the covenants continued being used in the 1950s and 1960s. Residential segregation through restrictive policies [and real estate covenants] dramatically affected the religious geography of Los Angeles and led to an identifiable spatial distribution of worship sites for denominations throughout the city. Many areas of Los Angeles were effectively closed to churches such as the AME Church, congregations of the National Baptist Convention, and the Church of God in Christ, as well as to all synagogues and Buddhist temples, to cite the most obvious examples. Furthermore, mainline Christian denominations encountered virulent opposition to efforts to construct churches in certain neighborhoods. Two examples are the Methodist Episcopal mission to the Japanese in the Pico Heights district in 1919 and the Japanese Presbyterian Church of Hollywood in 1923.19 Non-Asian “protective associations” pressured the sponsoring churches and publicized opposition to the establishment of religious institutions for the benefit of the Japanese. 19 Modell, Economics and Politics of Racial Accommodation, 60 -65. 20 For a further description of Heal LA, see John B. Err, Donald E. Miller, Wade Clarke Roof, and J. Gordon Melton, Politics of the Spirit: Religion and Multiethnicity in Los Angeles( Los Angeles, 1994). Just as the rights of African-Americans were recognized under Jim Crow, but it was simply insisted that they practice their rights somewhere else than in white department stores and build their churches somewhere else than in white bastions, so too in today’s America Muslims’ requests to local councils for permission to build a mosque is too often being denied on grounds that all Muslims are dangerous (just as it was thought by many whites in the early twentieth century that all African-Americans, all Jews, etc., were dangerous in one way or another). As for those who counsel the Park 51 Muslims that now is not the time, that Manhattan is not the place, that they should not hurt feelings, they are taking exactly the same line as the clergymen who wrote Martin Luther King to urge him to desist from his direct action campaign in Birmingham, Alabama, in 1963, as a result of which he had been jailed. King wrote in “Letter from a Birmingham Jail.” . He says that they called his campaign “unwise and untimely,” characterized it as “outsiders coming in,” and asserted that negotiations would be better than direct action. They implicitly accused him of impatience, of rocking the boat, of hurting the feelings of white folk who were not ready for his message. Muslim Americans are Americans. There can be no government Establishment of Judeo-Christian traditions, and no prohibition on how and where Muslim Americans worship. We are seeing attempts to foment a new Jim Crow, centered on mosques, which involves all the same fear-mongering, segregation, and special pleading for the majority that characterized the old one. It is important that this campaign against a Muslim community center in lower Manhattan not succeed, or it will be only the first in a long series of discriminatory policies throughout the country, as opportunistic politicians jump on the Islamophobic bandwagon. Those who believe that giving the Lazios and Palins and Gingriches this one will deflate the tension are misreading the historical moment. These are ravenous beasts, and giving them red meat will only send them into a greater frenzy, not satiate them. Asking people to give up their rights for too long will undermine those rights, just as justice too long delayed is justice denied.